Still making slow progress on Harvest Blooms. There is a great deal of detail with a lot of color changes to slow things down, but I think the end results will be worth it! I like the design. I was wondering about making it into a pillow. That will not happen any time soon though because I am determined to finish up The RUG. 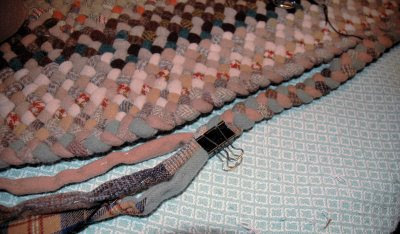 I just completed the 34th row on my braided rug. I am using light, medium, and dark color combinations, with the common color tan running throughout. Then, every third row, I throw in a "wild" color. I just finished up with the green as my wild color. I have just made the color change at the shoulder here. The 35th row will be the last medium color combination before I move on to the dark group. I have miles to go on this yet! This rug is getting enormous - more like a full blown carpet now lol. 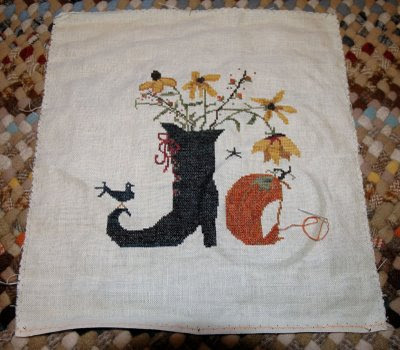 I love Harvest Blooms, so much I stitched it, lol. It looks great. Love Harvest Blooms. Think I might have to add that to my list. Your rug is gorgeous. Is it getting harder and harder to manage as it gets bigger? I love this piece! So fun!